We will be featuring more of K?Alexi Shelby soon ! 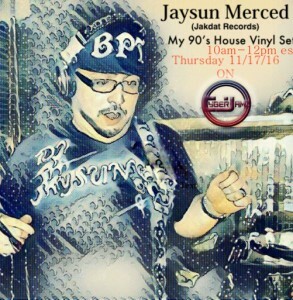 The Cyberjamz Radio Fall Slam Music Series took a very nice turn this particular week with Special guest artist/producer/remixer Jason ?Jakdat? Merced of Jakdat Records. He played a lovely 90′s vinyl set that is sure to take you back to that special time when vinyl and music made an impact for us deejay?s and dancers.We hope you enjoy and download this set. 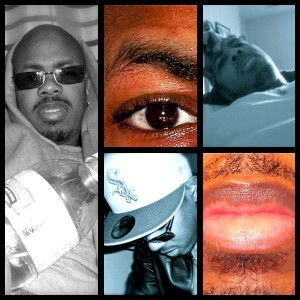 What we have here is a dope tech soul mix by the hot K Alexi Shelby? (K-Klassic) featuring banging cuts for your listening pleasure. 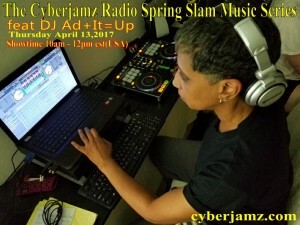 Check out the Cyberjamz Radio Spring Slam Music Series every Thursday from 10am ? 12pm est (USA time) as we feature deejays from across the spectrum. The Cyberjamz Radio Spring Slam Music Series continues with DJ Ad+It=Up .This deejay is a native of Brooklyn NYC and member of the legendary Deep House Page as this music programmer comes correct with excellent music selections.So check into her ?Addie?s Mixes? I always loved House Music, from the very first time I came from New Bedford, MA to Brooklyn, NY in 1986. Although, I love music, period!!! I like to think of myself as a musical connoisseur, due to knowing many artists and their sound creations throughout my life. Before moving to Brooklyn, I got to experience the Garage a few times when I would visit New York. When I came to Brooklyn in 1986, I started collecting mix music and listening to the DJ?s mixing on KISS 98.7 on Friday and Saturday nights into the wee hours of the morning. Tony Humphreys, Ruben Toro, amongst others tore it up for me. I started downloading my favorite mixes from Deep House web page, but before that, it was Ralph McDaniels? website that started it for me in collecting House Music Mixes. In 2013, I decided I wanted to create my own mixes for myself. So I bought a Serato and some DJ speakers and started buying music from Traxsource to build my library. I never thought of myself as a DJ, but as someone who likes certain flavor in House Music. I admire all DJ?s and their talents to create and enliven the crowd with their mixes. I want to be a part of the embodiment to move a crowd through my own mixes like I do myself. So, I am ready to debut my creations to the public and to stop keeping my sounds to myself. I hope you like and enjoy my Addie?s Mixes as much as I do. The Cyberjamz Radio Fall Slam Music Series w/Special guest D.j Tie Be was a really nice treat for us at the Headquarterz. This Dj/producer is our latest addition to our already hot line-up of music artist on our record labels. Keep your ear to the ground for his upcoming release packages coming soon ! Check out our Music Slam Series featuring Special guest Deejays from across the Globe every Thump-Day Thursday from 10am ? 12pm est (USA time) at the award winning Cyberjamz Internet Radio celebrating 14 years of music excellence. Cyberjamz Radio presents: YEAR of the WOMAN DJ ? The Music Series featruing the second half of music team ?Spirits in Motion?. My sister from another Mista & NuBang Clan family member Nadeeah Eshe layed it out for us last week at Cyberjamz Radio.Stream or download this bangin set as we continue to support her and all of our Women Deejays that make it happen across the globe. Cyberjamz Radio,Real Women House & JAS ? RescuePoetix Management pres: Year of the Woman Dj Music Series 2018 feat Montana Monti of Spirits on Motion.This show aried last Thursday April 26,2018 with my NuBang Clan sister Dj Montana and let me tell you she rocked it ! There is no playlist at time of airing,so download this set and enjoy the grooves.